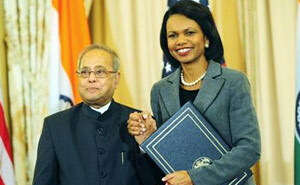 Pranab da in Presidential race, whether he likes it or not! Pranab Da is being pitched as the possible candidate for the post of President but he says he does not know if he will win the nomination. Or so says the media anyway. The Congress and the UPA itself has remained silent on the issue. Every one else is giving vague hints about a “general candidate” and “someone acceptable to all”. Which is pretty much as close to saying nothing at all as a politician can get since a President in India can only BE elected if they are acceptable to almost every one. But this state of affairs has not stopped “senior” journalists from chuckling and informing Pranab that he is going to be President, so he may as well say something about it. We find it truly amusing how his “I have no idea” gets translated into “oh the coy fellow doesn’t want to say”. Although examples are a aplenty, we believe this is an truly an amazing example of the Indian press just going ahead and creating a story because it seems to think – what the hell, there is nothing else to do. How would it be if we also tried the same thing? Media still silent over horse rumours! See? It works so well! P.S: Although, in case Pranab does become the President we apologize in advance for ever doubting your prophetic skills, oh senior journalist. P.S.S: Also, we would not mind Pranab Da being our President, if the Congress can spare him, since he would definitely bring a much-needed sense of dignity back to the office. Anyway his accent is thrilling.